Healthy Living- healthy eating, exercise, weight loss, veggie gardening, etc. Forums » Discussions » OFF TOPIC discussions » Page » Healthy Living- healthy eating, exercise, weight loss, veggie gardening, etc. Ok, we are now officially sick and tired of fresh tomatoes for the year. That sounds like a good program, @Hugssandi ! @Dusty-Turtle I remember watching some Chinese cooking show on tv long ago, and one of the secret ingredients was... ketchup! I followed the recipes from the show and the result was pretty awesome. Thank you, Strumelia. I'm doing the August Foundation schedule from HASfit.com, and it is a perfect, safe startup. All the vids are free on YouTube, too! Solid program. I'm sore, but it's been a good week! Tomorrow = rest day. Ken & Terry, I'm sure you will enjoy this soup. Don't be afraid to fiddle toward the finish and get the flavor just the way you like it. My wife actually adds ketchup, something I was radically opposed to until we were dining in a Mexican seafood restaurant in San Francisco one day and I saw someone adding ketchup to their own. If I overdo to the lemon juice or clam juice I will sometimes add some tomato paste. My wife and I both enjoy spicy food, and if we are the only ones eating I'll sometimes cut up a fresh jalapeno into tiny pieces, but you have to be careful with that since hot peppers vary so much in strength. Prepared hot sauces are easier to control. You can play around and see what you like. Bon appetit! Dusty, I'm gonna do it. Looks and appears delicious. Good recipe there Dusty! Cold soups are a great thing to serve in the summer. I make several kinds, and may have to add your simple Cocktel de Camaron to the repertoire. My wife has a big birthday tomorrow--the half century kind--but she and our kid are at Lake Tahoe kayaking and paddle boarding in the Sierra sun. So in anticipation of their return later today, I whipped up (little cooking involved) one of our favorite summertime dishes: coctel de camaron, Mexican shrimp cocktail. This is a cold soup, and the genius is that the base is spicy V-8 juice! The only cooking is the optional stage of boiling the shrimp. You can used pre-cooked shrimp, in which case there is no cooking involved, but I like to add some of the water the shrimp was boiled in to add extra flavor. This is a super tasty, super easy, very low-carb dish that takes a lot of prep only because of the time it takes to chop vegetables. Spicy V-8 juice -- clam juice -- lemon juice -- shrimp, bay shrimp, or prawns -- chopped tomatoes -- chopped cucumbers -- chopped onions -- chopped avocado-- chopped fresh cilantro -- whatever spices you like (I use onion powder, garlic powder, lemon pepper, and salt). If the Spicy V-8 is too spicy for you, use regular V-8 (or mix the two together). You can always add hot sauce such as Tabasco at the end, or offer it to be added to each bowl individually. It can stay in the fridge for a few days, so you can make a big batch to last, or serve it in small cups as a great appetizer for a barbecue or other warm weather soirée. Excuse me . . . I'm gonna have some now . . .
Good for you Sandi!! Maybe keep it small/do-able, so you don't wind up putting it off. Terry, I neglected to mention the large portion of potatoe chips though. heheh Yes I grew the cukes- their seeds are a bit large tho...will try a different variety next year. Dusty, I like mozz (and balsamic) vinegar on tomatoes sometimes too! mmmm! Day two of workin' out! WHOOP! WHOOP! Beautiful tomatoes. Our tomatoes didn't do so well this year. On the small side. Lisa, did you grow the cucumbers too? Some friends gave us 2 quart bags of the largest blueberries I think I have ever seen. Sweet. Oh my yes. Good for you, Lisa. Your goodies are much better for you than my meal of deep fried Bluegills last night. Then leftovers today. You gained 6 months of life, while I lost a year. Oh well. Those tomatoes look wonderful. The woman across the street from us has a huge garden and no one to feed, so we get all hers. Never heard of taxi, though. I prefer some fresh mozzarella and basil to sour cream any day. We're finally hitting out tomato season!! This year is a first in that our garden tomato eating is actually overlapping our blueberry picking. This is what we wait for all year long... the blueberries and the magnificent tomatoes. 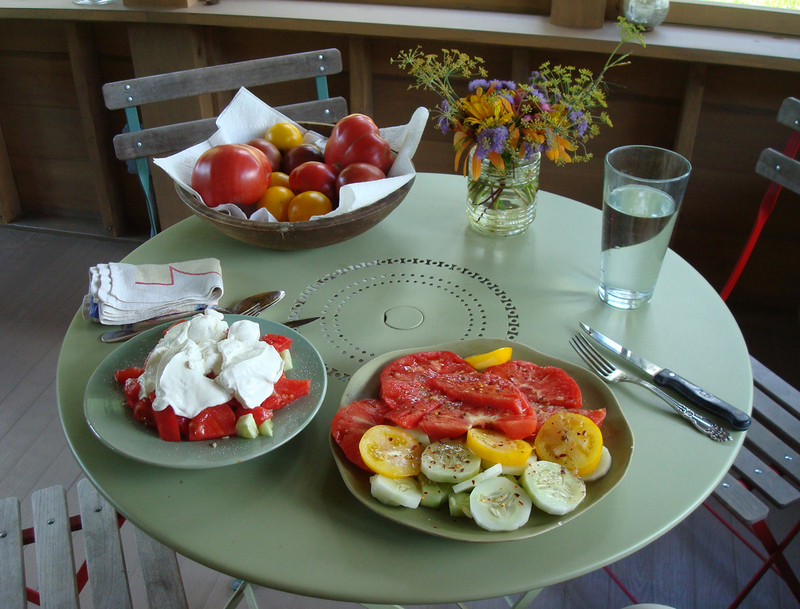 Here was our lunch today on the new screen porch, also with cucumbers from the garden. The yellow is a tomato called "Taxi". Yeah I probably went a little overboard on the sour cream, but hey. Hey Guys, When I read Dusty's post about cold brew coffee, I was intrigued since I love ice coffee in the summer. So I Googled it and chose a recipe and made some. I steeped it for 24 hours and it was good but not strong enough. So I will let my next batch go longer, maybe only 48 hours. Lulu: Wish i could drink strong coffee because I love the taste. Alas, I must avoid caffeine! I was also told by one doctor to avoid coffee because it aggravated my acid reflux problem. But that's another benefit of cold brew. Although it still has the caffeine, it has no acid! Obviously, for those with acid reflux it would be best to avoid all coffee, but if you're like me, there are mental health benefits to coffee, and cold brew is a way to drink it while minimizing the acid reflux problems. Wish i could drink strong coffee because I love the taste. Alas, I must avoid caffeine! Strumelia:@dusty-turtle , is that a quart sized mason jar or a pint? And... once you've made your jar and put it in the fridge, how long is it good for would you say? The mason jar I use came with the conical filter. It holds 6 cups, so it's like a quart + a pint. The cafe owner who turned me on to this stuff makes her cold brew with a big cheesecloth bag and a 5-gallon bucket. If you search online you can find all sorts of devices for making cold brew, most much smaller than my 6-cup jar. But you don't really need fancy equipment. A container and some kind of filtering system is all you need. You could even use one of those French press coffee makers. The only question would then be the ratio of coffee grinds to water, and I'm sure that information is available online. And remember to use coarsely ground beans. Pre-ground beans are way too fine. Also, apparently, those cheap coffee grinders that actually cut the beans up are no good. The beans have to be actually ground (don't ask me why), which is why I got a cheap hand-grinder. How long will the coffee last in the fridge? Good question. I don't know for sure. I usually pour the coffee out of the big mason jar into smaller mason jars so that my wife can take one to work if she wishes. My sense is that they could last a long time sealed in those jars in the fridge. When I pour the coffee from the big mason jar there is some sediment at the bottom that makes the last 1/2 inch or so unusable. I just dump that. @dusty-turtle , is that a quart sized mason jar or a pint? Acouple of weeks ago I was at a business meeting at a hotel whose bar advertised cold brew coffee. Just after lunch I left the meeting to order some. They poured a few ounces in the bottom of a large glass, filled the glass with ice, and then poured in a bunch of water. They were treating the cold brew as a coffee concentrate. That's probably a safe way to consume it, though you lose some of that strong flavor, obviously. Lisa, I enjoyed your post, and am interested in Dusty's response. I love strong coffee. Three cups every morning, but none after 09:00am. Same sleeping problems as you. Also would interfere with afternoon nap. Yes, the grounds sit in the water for 48 hours. The contraption that I have came with a recipe book that suggests 12 hours is enough, but the first 12-hour brew I made was not nearly as strong as the original stuff I had from that cafe, so the next batch I increased the "brewing" time. I eventually settled on a minimum of 36 hours. The cafe owner that converted me claims that more than 24 hours will create a bitter taste, but that has not been my experience. I think that dynamic is determined by how coarsely the beans are ground. I hand grind my beans in a very unscientific manner so my exact method may not be reproducible. The water is not hot to begin with. In fact, the brewing process can take place in the refrigerator, but I start with cool water and leave it out on the counter, not refrigerating until after I remove the coffee grounds. My headache yesterday was from a sleep deficit. But you are right about watching out for the strength of the coffee. I usually dole it out in very small doses, which is why I can say for certain that I had 2 ounces yesterday. I never pour a whole bunch in a big glass as you would if you were serving iced tea. And it sometimes "hits" you as much as an hour after consumption, so it's easy to overdo it. From left to right: a manual coffee grinder, an empty mason jar eager to start brewing, a conical strainer, and a batch of cold brew that will be ready this afternoon. In the foreground, a cold brew recipe book which I never use because almost all the recipes involve something sugary, and I just enjoy the taste of plain coffee. Yes, I am well acquainted with that watery coffee every cafe and diner served us for decades. It was not only the brewing method that made that coffee so bad; it was a different kind of coffee. For some reason, after WWII, Americans stopped using Arabica beans and switched to some other lesser coffee bean. The coffee renaissance that we associate with Starbucks has involved a return to the Arabica bean. Yum! Dusty you are making me want to try that stuff now. Brian usually drinks like 4 cups of regular brewed coffee per day, and me 2-3 cups. (I try to stop by 1 or 2pm, otherwise it keeps me from sleeping deeply.) We use the paper filter hand-pouring method. Coffee is one of our favorite indulgences! Over the past two years there have been quite a few articles about coffee (in reasonable amounts) being GOOD for one's health. Yay!! Do you mean your grounds sit in thier cone filter immersed in the water for 48 hours? And... is the water you pour in hot to begin with? Hmm..I think I may need to turn to Youtube for some tutorials here. I don't want to ingest 'too' much caffeine however- I've found too much does make me feel icky, and definitely interferes with my getting deep sleep cycles. Dusty do keep an eye on whether you might overindulge and then experience any caffeine-withdrawal headaches- which of course get 'cured' by.. another shot of caffeine! 'Hair of the dog' kind of thing, but you don't want headaches to begin with. I'm thinking that maybe cold-brewed coffee is powerful in the same 'visionary out-of-body experience' way as when Americans try Turkish coffee. There's a reason the Turkish drink their coffee in those tiny little cups. Some of us are old enough to remember pre-starbucks times in America when everyone just drank watery Bunn-o-matic Maxwell House diner counter type coffee that you could practically read a newspaper through. (what's a newspaper, some might now ask). American coffee used to be real watery from when I was a kid in the late 1950s all the way up to maybe the past 25 or 30 years it seems to me. Back then only weirdo beatniks drank espresso(aka 'foreign' coffee) in subversive coffee houses. It's great to have a 'vice' that might actually improve one's health. Thanks for your 'uplifting' post, Dusty! Well, how healthy it is depends on what doctor you ask. I read an article today that reported on a recent study concluding that four cups of coffee per day is ideal to keep an aging heart young. That's my excuse to claim that this post relates to "healthy living." I recently discovered cold brewed coffee. Last summer I asked for an iced coffee at a new cafe across from the Strum Shop which hosts our monthly dulcimer gathering. I was asked if I wanted regular iced coffee or cold brewed. When I asked what the difference was, I was told merely that cold brewed coffee is "a little stronger." Yeah, and Everest is "a little" hard to climb. I had a near religious experience with that first cup of cold brewed coffee, drinking only an inch or so off the top and feeling happy and energized for hours. (That must be how Elvis felt when he first got hooked on liquid methamphetamine.) I brought the rest home for my wife, who had a similar experience. Now we make it ourselves. I have a cone-shaped mesh filter that sits in a large mason jar. I hand grind dark roast coffee beans, put them in the filter, and pour in water. I then let that sit for 48 hours, remove the grounds, and refrigerate the coffee. About every other day I make a batch. The stuff is delicious. And strong. And it makes me happy. Earlier this afternoon I had a headache. I took an ibuprofen and drank about 2 ounces of cold brewed coffee. I then sat in a dark room for about 15 minutes. And now I feel great. Life is good. I can only speak for myself and not all Americans. I develop swelling about 2 inches across from mosquito bites and they take a long time to disappear, like over a month. I react to any bug bite. They love me. In fact I often say that if a bug is a vegetarian, it will still bite me. I ended up in the emergency room over a hornet sting. So, I certainly have not built up an immunity to mosquito bites over the years. Last year we added a screened in porch to the back of our house and it is wonderful to sit out without being besieged by bugs. Mosquitoes love me. My body reacts to all types of insect bites to such an extent that when I put on a shirt which had a wasp in it the resultant swelling was the size of a tennis ball. The doctor, who later treated me with steroids, called all the partners in the practice to see it. Mosquito bites are not as bad but nevertheless are a source of great discomfort. So, I have read all I can about how to avoid them. I have lived and worked in Thailand and must have seen just about every device and method to reduce their numbers. I could write pages and pages about them but for the sake of brevity I will ask just one question about America and its mosquitoes. None of my Thai family are bitten by them. They walk around the house with legs and arms exposed and never a sign of a bite. One theory is that their diet is substantially free of dairy products and this makes them unattractive to the nasty little creatures. My question is - do Americans develop an apparent immunity against mosquito bites over a period of time ? Yep, screened porches are wonderful. I've noticed that during our weekly family get togethers, our grandkids seem to gravitate to the porch. No TV. It tickles me to watch my 8 yr old watching birds, etc., with binoculars. Yep, screened porches, gotta love um. I'm really envious of your screened porch, Strumelia. It does seem to be a perfect place to eat or play music. I get excited the first time I see English peas at the market. Usually they come towards the middle of summer, but they've already arrived this year. I used to gather recipes for them, but I've realized that I like them raw better than prepared. So put away the chips and popcorn. I'm gonna sit right back and shell a bunch of peas! Yum! I love Spring... it inspires me to cook more and to prepare healthier food, for one thing. We have fresh ruby red leaf lettuce growing in the garden now, so making fresh salads is a frequent thing. Today I'm tying the young tomato plants to their stakes.. they're now tall enough to get damaged in a heavy storm. We are very happily enjoying our new large screen porch we put in last Fall. So nice to eat outside in the evening by candlelight ... crickets chirping... with not a single thought or care about mosquitos! I've managed to lose a few pounds during the past 6 months by eating a little more fruits and vegetables, and a little less junk. Tomato season ended here November 10th. Longest season in my memory. Got mobbed by customers looking for their last real tomato until next summer. Even the greens went. Ill spend all of January cleaning up. In the mean time I'm sleeping late and learning new tunes... Robert. Oh man, once tomato season winds down, I lose all interest in working in my veggie garden, and the weeds always get the best of me. Dang! I love gardening digging/planting/weeding/picking in the Spring and all Summer.... but by Fall my spare time energy usually turns to sewing, knitting, cooking, and playing music (aside from my regular day job, I mean...I'm not retired yet). This Fall the weeds got especially out of control since I was sick for a couple of months at the end of Summer. What a mess the garden became...difficult to even walk through it. And the perennial flowerbed, and the overgrown thorny raspberry patch and the masses of 7 feet tall decorative grasses... I really needed someone strong to come in and help clean up before Winter. But I had a heck of a time finding someone who either wasn't all booked up or didn't cost a fortune. The fellow who has helped me in the past had moved away. I kept making phone calls, following leads...and the days were ticking by and it was getting colder. The forecast is predicting some snow and sub-freezing after this next week, so I was really getting nervous that I'd have a horrendous mess on my hands next Spring if I couldn't get someone in time. The good news is I found a fellow who was available, happy to work for a decent rate, and who knew what he was doing. Yay!- this swell feller came today with his pickup truck and wheelbarrow and hedge trimmer and clipper....and he was like a tornado going through the beds and paths pulling weeds and raking and clearing. I bought a ton of mulch at Agway and he went to pick it all up with his truck, and he'll rototill my veggie beds, then spread the mulch for me... 40 big bags of wood chips/a whole pallet, and 8 bales of straw. He's going to save my lower back for sure, and i won't spend the winter dreading Spring! After asparagus & strawberry season, we switched to high tunnel tomatoes. Been picking vineripes since late June. After three years my 150 ft long blackberry row is loaded with more fruit than I'll ever pick. I wish I had time to enjoy summer but field work takes the joy out of it. Winter time is my fun time... Robert. July... it's mid blueberry time in our garden! Also now the first year we're getting substantial raspberries. I've been picking string beans and making big bowls of green beans vinaigrette (adding varying other ingredients like black beans, corn, red peppers etc). I gave the first big head of cabbage to my daughter when she visited, but now it's time to cut one for us and make nice coooool cole slaw! I've been able to keep up with my new modest fitness walking goal- twice a week doing a brisk 2.5 miles in the village fairgrounds, which has lots of nice paths with no car traffic. Sometimes Brian comes with me which is nice. Wow that's a whole bunch of amazing produce, Ken! I bet you cook up a storm with all that. My older daughter & her wife buy a farm share too, between Spring and Fall... since they live in an apt with no yard in a city. They really plow through those veggies...they have a juicer machine and they use it almost every day. They do grow a mini windowbox of herbs on their window railing in the Summer. A couple months ago we joined a year-round food co-op that offers a veggie box or produce box for $20 or a combo box for $25; plus lots of individual veggies and fruits for sale at way below local megamart prices (golden beets for 50¢ each vs megamart bundle of 3 for $4.49, and parsnips for 33¢ each instead of a bag of 3 for $3.99). We've found a combo box works just about right for us. There's no mandatory buy, and they have a number of pick-up points around the area. I love garden fresh vegetables, so glad it's Spring! Well, I pretty much finished planting the veggie garden today. Looks like our cold snap is over, weather getting warm and normal for the next week or two. All the beds are forked and hoed. I don't mulch the beds, but i do keep them fluffy. The earthworms do much of the work. Planted in 12 tomato plants, some green bush beans, got all my lettuces and onions and a few cabbages in too. Some coriander and sage. They didn't have the type of cucumbers I wanted- guess I'll buy a packet of seeds for those. I have other lettuce/mesclun seed which i'll continue to plant at intervals. Skipping the zucc & summer squash this yer- the plants get so big and messy and are so cheap to buy anyway... unlike greens and tomatoes which are expensive. Don't buy some sort of highly processed monk fruit sweetener, but just the juice without additives, or the dried melon itself. I have not tried monkfruit but do know of very many recipes using dates. I was looking at the sweetener aisle this morning and wondered about monkfruit. I have gotten completely away from most all sugar but might want to sweeten an oatmeal crisp fruit dessert and wondered if any of you have ever used monkfruit and if so, what brand or form did you use? Love your update! I wanna get in on those alfalfa sprouts... My grape vine is looking good, but I think it will need another year before it produces. We have blueberries on the bush that the birds always get before we do. No blackberries yet, *I think*, and it will take another year or two before my hazelnuts produce. We did make the front prettier and have plans for the back, so that we can live outside more. (Upcycled picnic table, seating, etc.) I actually pulled up my square, raised beds for veggies, as we need to buy dirt, and it's gotten late again this year. :( I'm regrowing a cabbage my windowsill~does that count? I'm pretty good about growing alfalfa sprouts in the kitchen in quart mason jars all winter. I keep a constant supply going for us, and boy they sure taste wonderful when they are absolutely fresh as opposed to store bought sprouts. It's easy, you just have to remember to rinse them once or twice a day while they're growing. Since I keep the jars in the dish drainer next to the sink, it's not hard to do. The sprouts are our biggest source of fresh greens all winter. It's great to be able to pile them generously on meals or sandwiches. But now... it's Spring! I've been doing a lot with the beehives and thus kind of neglecting my vegetable garden so far. Today I finally pushed myself to get half the veg garden rows hoed up and planted with some onions, a few cabbages, and a whole lot of various tiny lettuce babies I bought in flats. Boston lettuce, romaine, and leaf lettuce -all those in both bronze/red and green- and some iceberg. Still three weeks away from planting tomato plants, which I'm pretty big on too. The nice thing about vegetable gardens is that you get a little pleasant exercise outdoors while also producing healthy stuff to eat. A win-win situation! Beach pics have a way of making you see what you don't wanna. :( This morning I did a 20-minute, PowerFit Harmony workout. My wife and I might be doing the elimination diet in April. If you ever have expected food allergies this diet is one that can help you figure out what your allergic to. One note it seems as it is going to be a bit challenging for us. I'm cutting back on all sweets and watching portions. Trying to eat super nutritious things that fill me up. For breakfast, after my coffee of course, I had a whey protein smoothie made with plain greek yogurt, frozen banana, raw cocoa, almond milk and powdered peanut butter. I used to lift weights every other day but once that habit stops, it's SO hard to get it back. I loved having firmer arms and all so I need to do it. Going 3x per week is fantastic Strumelia! Mid-winter cold and grey...craving some fresh grown greenery but certainly no early gardening possible yet. A few years ago I had been doing a lot of growing edible sprouts in my kitchen, and last month I started back up doing it again. It's both fun and uplifting in the middle of winter to see the jars and containers of little sprouts growing. Compared to buying lettuce and greens (or even sprouts) at the supermarket, home grown sprouts are not only way more nutritious, but incredibly cheap- I find that a one pound, $12 package of alfalfa seed will produce around 100-150 cups of sprouts. It's actually enjoyable to 'tend' them twice a day with a fresh water rinse/drain right in their jars, like having miniature greenhouses growing on your kitchen counters. After about 4 or 5 days they are ready to rinse in a large bowl to skim off the empty hulls, and put into the refrigerator for eating! Sometimes they don't even make it to the fridge... Brian has to be scolded about eating an entire batch at one time as a big salad...hey, leave some for me! For the past several weeks I have about 5 jars going at a time with different seeds at various stages. A mere 2 tablespoons of alfalfa seed will produce 4 cups of yummy fresh sprouts... ! Thanks DT. I've got well over a year's worth of good eating there. Ken, was just reading through some of the recipes you posted. Definitely made me hungry. Lady Sally is lucky to have you catering (literally) to her desires. One thought: if you find the walnuts in the Waldorf Failure to be too bitter, perhaps you could use candied walnuts. It might mean less apple or mandarin or other of the sweet stuff, but it would be a way to increase the use of one of the required ingredients. Just a thought. Lady Sally wants to lose some weight (like most of us), and she's asked me to create 400 calorie or less, healthy, filling dinners for her, and then post them on my weekly food blog. New posts every Monday: http://foodingaround-kiltedcook.blogspot.com This week there were three good choices. Wow, June was so hot that for the first time ever, our backyard blueberry harvest is now overlapping with our garden tomato season. Today I made a big blueberry pie AND picked several gigantic ripe red and yellow tomatoes. I think we may have another 10 days of blueberries or so. Spent an hour and a half working my way along the rows pulling up weeds in the vegetable garden. Probably three more days of the same to finish that round. The bending is tough, but I find kneeling is worse. sigh....then you blink and the weeds are all back again...lol. Hey here is something that is not too bad for the diet. Bev (my wife) made a rhubarb/strawberry sauce that goes over cake. five cups of rhubarb a package of fresh strawberry's (we added the strawberry's for color because we have green rhubarb) a little bit of honey. Very tart and very tasty if you like rhubarb, this is right up your ally. P.S. you can leave out the cake if you want to. Good for you Folkfan! It's not easy to stick with it, but you must feel great about it. Well, I've been doing something healthy. I've been losing weight. My doctors are extremely pleased with me. Since last September I've shed about 50 lbs. My system is simple. I look in the mirror and say to myself. Whales need blubber, Walruses need blubber, seals need blubber. You are not a whale, a walrus or a seal. You don't need blubber. Then I write down in a notebook everything I eat. Keeping to about 1,200 calories a day has meant that I've been losing about a pound a week. I'm in a holding stage now and trying to determine how many calories I can eat without putting weight back on. I'm still keeping my notebook and intend to note what I eat for the rest of my live. Having taken it off, I'm going to keep it off!!!!!!!!!!!! For most of my life I jogged pretty regularly. It was a cheap way of getting really good exercise and could be done anywhere in the world. And sometimes I was able to enjoy really scenic runs, such as the hills above Berkeley overlooking San Francisco Bay, the SF skyline, and the Golden Gate Bridge, or a run I used to do in the rolling hills of Iowa where I would see no other people or cars for an entire 6-mile run. But recently some problems with my feet, ankles, and knees have made it kind of risky for me to run on the roads. Eventually I joined a gym and it took me about a full year of running on the treadmill regularly before I taught myself to do it. The meditative zen that I could achieve on the roads when I was lost in my own thoughts was really hard to find on a machine in a brightly lit room next to another machine with another person huffing and puffing and another machine next to that one and . . . . Eventually I learned to ignore my surroundings and get into a groove despite the fact that dozens of strangers were sweating only a few feet from me. I can't say that it's not boring but rather that eventually I learned how to do it despite the boredom. No, the bicycling to the gym part is not boring, it's the 'stationary' treadmill at the gym that's boring. I'm never bored riding my bike. Or maybe she got it from this song by Loudon Wainwright III, who insists that "Four strings made of nylon always put a smile on/Anybody's face who's feeling blue." Why? It'll pick you up, you know it's just the thing. Hey, I have Kaiser! Do you think they might issue me a uke, like they did my cane (not the Hurrycane, mind you)? No, the bicycling to the gym part is not boring, it's the 'stationary' treadmill at the gym that's boring. I'm never bored riding my bike. But it's very hilly here and it can get terribly hot and wipe me out. I need the gym to get more of a whole body workout. I rode to the gym today again on my bicycle. The gym is boring as all heck...but it felt real good after i got home. Did lots of spinal bends and twists today too. This! Music has ALWAYS been my stress release. It is great for your health. I'm blessed that music has been a part of my life since age 9. Well, what I plan to do and what I am actually doing are not matching up at the moment. I would like to lose about 7-10 lbs, not so much a weight issue as a firming up issue for me. Gravity is winning the battle but I am not giving up the fight! I have a family membership at our local Rec Center which was recently taken over by the Y. Rarely go due to crazy schedule - my 12 year old keeps me busy durinng the school year, hopefully will start a regular work out routine when school is out soon. I sit at a computer all day for work so I really need to start walking more - another goal this spring/summer. One thing I started a few years ago is a change in my diet. I guess you can say I follow somewhat of a paleo diet - unrefined and raw, whole foods whenever possible. I try to not eat foods with flour andsugar too often.Moderation is the key. I have eliminatedfoods containing MSG, preservatives, corn syrup, food coloring, soy-based additives, and refined oils which means I rarely use boxed or pre-made foods.I cook with olive or coconut oil,and real butter. I have been eating more salads and vegetables, nuts, and alittle fruits (I avoid consuming too much fruit sugars) I eat grass fed meats (when I can get them) and whole milk dairy (I drink raw cow and goat milk), free range eggs. I got a Ninja food system over the winter (burned out my Nutrabullet) and I make a green smoothieevery other dayas a meal replacement. It contains kale, spinach, collard greens, arugula(I rotate the greens), fresh basil, fresh rosemary, powdered Matcha green tea (great antioxidant), vitamin D and oregano oil drops (occassionally magnesium drops), raw honey, raw milk, organic whole milk yogurt, real vanilla, mango and banana chunks. I freeze the greens and fruits and add 4 ice cubes so it is very thick and filling (and delicious!) I have seen a big improvement in my health andnot one cold this winter, first time ever! I don't have high blood pressure, but I would have to agree that music reduces stress and helps us deal emotionally with whatever life throws our way. I haven't lost any weight yet (nor eating less)....but I have joined back up at the gym with Brian and we do go 3 x a week now. about 45 minutes each time. That's something at least! You guys are impressive!! I have lost 20 since mid Jan..with pretty much the same method. i am measuring food.i wish i could say i have more energy. But i have a lot to lose. Since the beginning of the year I lost 25 pounds and am still working my way downward. I did this mostly through portion control and a slight change in diet. I am limiting sweets, not going for seconds, etc. Now that winter appears to be over I am to get outside more and increase my exercise. I hope to double my weight loss by the end of the year. I have more energy at the moment. Yoohoo - am I the first? Okay, I'll start. I retired in January because my employer shut down.I'm home all day.Busy but relaxed. I'm outside in the yard almost all day.Our wooded lot means I can work in the shade from morning until dark.My BP was always high when I was working. Went to the doc and BP is now 115 over 75. Retirement is good for yourhealth. Breakfast was yogurt, 1/2 banana and coffee (a major food group); lunch was celery, cumber and red pepper with grated Italian cheese- eaten leisurely on the shaded back deck; dinner was a salad with ham - the real ham from big chunks - , a crescent roll and carrot cake, all with a nice glass of Riesling.Also use an elliptical, going 3.25 miles in 45 minutes on level 15 out of 20 on the machine. Tryin' to live a bit longer!! 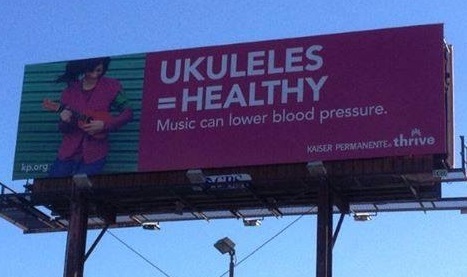 Oh, and playing dulcimer is good for your health, too. Iwork on a song or 2 each morning and again in late afternoon. Ear yoga. I'm always more tranquil after playing tunes. Tell us about your healthy goals and activities!